… the unemployed regain jobless benefits and the GOP heaves a great sigh of relief. And Bunning’s next opponent has a goldmine of opposition ad material. The Senate headed reached a resolution of an impasse over unemployment pay on Tuesday night after Senator Jim Bunning, Republican of Kentucky, dropped his objection to extending jobless benefits in exchange for a largely symbolic vote on paying for the aid. Mr. Bunning’s agreement to relent essentially short-circuited an intensifying political battle that had already resulted in 2,000 workers at the Department of Transportation being furloughed without pay and in the temporary cutoff of benefits to thousands of out-of-work Americans. It came after Mr. Bunning’s fellow Republicans began to air their own concerns about how the Senate blockade had the potential to damage their political brand while also having a direct impact on their constituents. The Senate later voted 78 to 19 to renew the programs. 9/11 didn’t happen under Bush’s watch? Man, it sure seems like he was POTUS in September 2001. This bit of revisionist history — the idea Bush was not president when 9/11 occurred — seems to be something of a right-wing meme. So far it’s come from Mary Matalin, Dana Perino and Rudy Giuliani. You could make the semantic argument that the terrorist attacks were’t under Bush’s “watch” because he’d only been in office for less than seven months (although there is very solid evidence his domestic defense team knew about the threat and did nothing to act on the intel), but to take one example from above — Giuliani’s — the quote is very direct: “We had no domestic attacks under Bush. We’ve had one under Obama … ” And of course 9/11 wasn’t the only domestic terrorist attack during Bush’s presidency. Two high profile examples are the shoe bomber and the anthrax attacks distributed via the U.S. Postal system soon after 9/11. Not any more. When that quote is preserved for all to watch online at will — all three links above go to video of the statement in question — there is no way to spin your words unless you want to admit to either being quite confused, ignorant or a blatant liar. Yes, there is a fringe of the GOP base that will hear these quotes and completely forget the Bush 43 administration presided over the worst domestic terrorist attack in U.S. history, plus a few more to boot. That base won’t win elections. These lies won’t entice any swing voters, and could absolutely force those voters away from the party. That does seem to be what the GOP has become at this point. Catering to a dwindling base at a moment in U.S. political history where the Republican Party could be making great strides back to the fore. According to Rudy, it appears the republicans define “terrorism” much in the same way Clinton defined “sexual relations”. With that in mind, would you rather be represented by a politician who dissembles about personal behavior with no broader implications, or a politician who does the same on issues of national security? Not really too surprising given the overall tone of LGF the last year or so, but in a sense the right wing blogosphere lost something of a rock star with this announcement and ten part list of exactly why Johnson is no longer affiliated with right wing politics. Bartlett is an interesting read these days. One of the major supply-siders back in the day, his economic positions seem to have shifted a bit. He says, and I tend to agree with him, he’s only reacting to the conditions on the ground and his fundamental economic beliefs are no different than when Reagan held the White House. Of course a value added tax was one tax vehicle in the supply-side economic toolbox. In a move that probably makes the heads of his old pals in the GOP explode, Bartlett writes in Forbes an extended defense of, and recommendation for, a national value added tax. few years ago, I concluded that the magnitude of our looming fiscal problem was so enormous that higher taxes were inevitable–and that was long before the recent crisis made matters vastly worse. Moreover, I concluded that the magnitude of this tax increase is so great that it would seriously cripple the economy if accomplished through higher rates on an already dysfunctional income tax system. Reluctantly, I concluded that a value-added tax (VAT) is the best way to raise the revenue that would, in any case, be raised. When I first made this suggestion in a Los Angeles Timesarticle in 2004, I was building on a large body of tax analysis showing that the VAT is the best known way of raising revenue. When I say “best” I mean that it raises large revenues from low rates and has minimal disincentive effects. In economists’ speak, it has a very small dead weight or welfare cost–the economic output lost by the tax over and above the revenue collected. Not good numbers for the GOP. 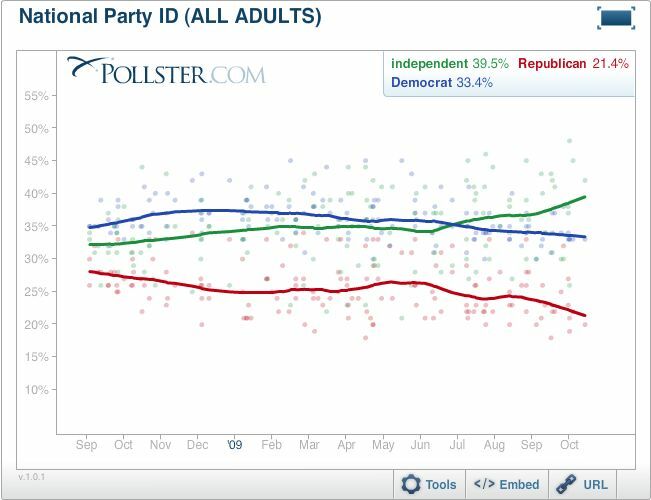 Particularly that green line (independents) that is probably made up of quite a few voters who formerly self-identified as Republican. … is practically glowing since it fails to point out she’s absolutely batshit crazy. Is the stimulus creating jobs? Depends on who you ask. From this desk chair it doesn’t look like it’s doing all that much, but these numbers do have a way of sneaking up on you. Is the largest one-time economic recovery effort in U.S. history creating jobs? According to new reports from governors across the country, it is. Republicans in Congress say it’s not, and the debate is getting louder. And it takes nine slots to get to the first elected official — Jim DeMint. Sarah Palin clocks in at number two behind Rush Limbaugh. There really is no mystery why the GOP is becoming so marginalized. Angry volume and right wing media exposure do not mean legislative or electoral success. In 1987 comedian David Brenner bombed in syndication with about 2.5 million viewers at midnight — which is roughly what Fox, the leading network for political talk shows, averages in prime time.